The staff at Insight Observatory can't think of a better way to start of 2017 other than with a "blog share" like this one. The following article posted in Sky and Telescope Magazine excited us when we read it and inspired us to share it out. Encouraging young astronomers to contribute to professional astronomy is what Insight Observatory is all about. When astronomers and astrophysicists descended on Grapevine, Texas, this week for the semiannual conference that m.any call the "Super Bowl of Astronomy," they were joined by the meeting's youngest participant ever. 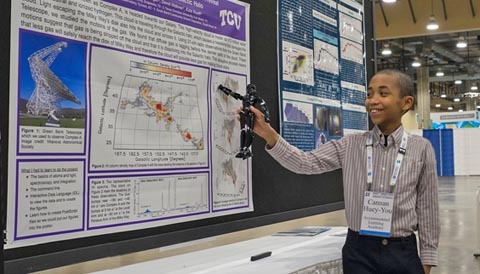 This past Friday, 11-year-old Cannan Huey-You walked up to his poster and described research on the object known as Complex A, a massive gas cloud destined to crash into the Milky Way. Already a high-school senior, Cannan has been working with astronomer Kathleen Barger for the past 2½ years. An assistant professor at Texas Christian University (TCU), Barger was looking for a student to assist with her radio observations of gas clouds near the Milky Way. For Cannan, long interested in astronomy, it seemed a good fit.